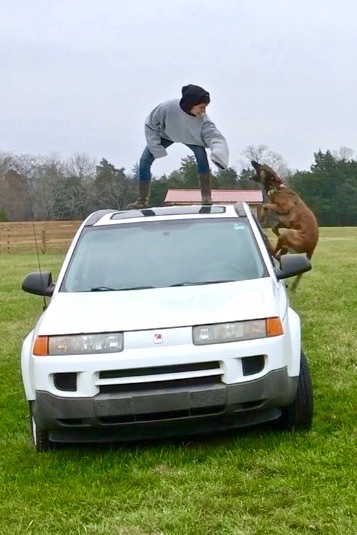 You think getting on top of a car will stop me?! On April 3, Global K9 Protection Services will host the annual Spring Fling to welcome neighbors, the surrounding communities, and all dog lovers to their farm facility for a fun, exciting and informative afternoon. The no-admission event will take place from 2 p.m. to 5 p.m. at 1836 Old Natchez Trace in Franklin, Tennessee. At this event, Global K9 Protection Services’ friendly protection dogs will be socializing with the public, giving kisses at the kissing booth, strutting their stuff at the dog training obedience workshops and leading visiting dogs and guests on a dog bone hunt through the hay field. This event will feature thrilling, interactive demonstrations where people of all ages can participate and handle advanced protection dogs with ease under the direction of the Global K9 experts. The demonstrations will include jumps over cars and attacks on decoys. Country music artist Amanda Watkins, pop-rocker Cal Ecker, and local rock, blues and soul band Juke House Saints will be performing throughout the afternoon. Williamson County Animal Center will have dogs available for adoption on site. Dawg Daze will be serving hot dogs and other specialties. Spring Fling attendees can also enter raffles for the chance to win an eight-week Obedience Class and many other prizes. Courtney Graham-Robbins, co-founder and training director of Global K9 Protection Services, has spent her life training animals and has earned impressive credentials through her military service. Both royalty in foreign countries and multiple U.S. presidents have been serviced by Graham-Robbins, as well as locals, Williamson County Animal Center and animal welfare group MTPRC, Making Tennessee a Place that Really Cares. “Custom training hand selected dogs to protect you and your family is what I love and what I do. In addition, helping owners learn to communicate with their dogs and see their ability to behave more favorably, and most cases-in a very short time, is like watching people meet their dogs all over again. Sometimes they jokingly ask me if it’s the same dog because of the transformation.” Graham-Robbins said. CEO and Co-Founder Diane Rubin Cooke’s passion is in taking care of the animals and the owner’s needs and making sure everyone leaves happy. The Spring Fling will offer something for everyone. See why Personal Protection Dogs can save the day where a gun may end it tragically. Global K9 Protection Services main training facility is located on 23 acres of beautiful farm land in Franklin, TN where they customize, extensively train, and sell the healthiest personal protection dogs and offer the most reliable dog training, obedience classes and private training sessions for clients worldwide. For more information, visit http://www.globalk9protection.com. You think getting on top of a car will stop me? !Training dogs for real life scenarios is what we do!